(Bloomberg) -- President Donald Trump retreated from threats to immediately close the border with Mexico over migration, instead abruptly pivoting on Thursday to a new demand: that the Mexican government stop the flow of illegal drugs into the U.S. within a year or face car tariffs. Trump also threatened to impose car tariffs if the country didn’t step up its apprehension of migrants transiting through the country to the U.S. from Central and South America. The remarks, following a week of back-and-forth threats to close the border, risked further muddying the U.S. relationship with its second-largest trading partner. 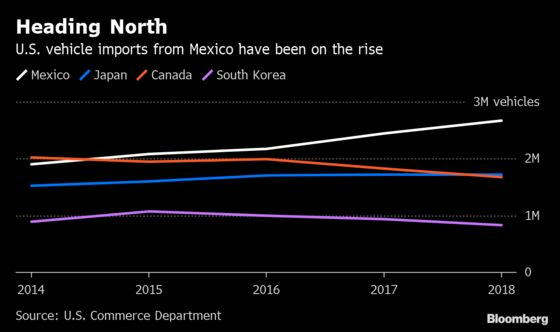 Putting tariffs on Mexico-built autos would risk hurting U.S. companies including General Motors Co. and Fiat Chrysler Automobiles NV, which import key models from the country including Chevrolet, GMC and Ram full-size pickups. The U.S. imported 41 percent more vehicles last year than in 2014, according to Commerce Department data. The influx of cars from Japan, the second-biggest source of imported cars, was relatively stagnant in that span, and fewer were imported from Canada and South Korea. Trump said Mexico has improved immigration enforcement since he threatened to close the border last week. He has repeatedly used tariffs -- or the threat of them -- to achieve his policy goals, and has previously mentioned penalties on imported vehicles and auto parts. Trump said the “whole ball game is cars,” but also opened the possibility of imposing penalties on other products as well. Trump’s administration and the Canadian and Mexican governments last year concluded talks on a revised version of the North American Free Trade Agreement that would be called the U.S.-Mexico-Canada Agreement, or USMCA. The new trade pact is currently awaiting congressional approval. It wasn’t immediately clear how Trump’s threat of car tariffs would affect the agreement, and the president indicated he didn’t care.